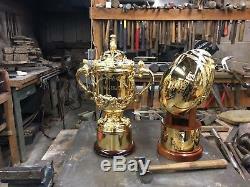 Crafted by the Goldsmiths and Restorers of the Webb Ellis Cup, this one of a kind work of art is the ultimate collectors' piece from the greatest Rugby World Cup tournament to date. 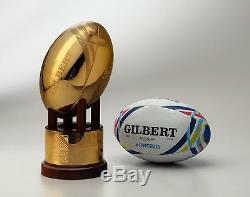 Produced directly from Gilbert's original design files for Rugby World Cup 2015 match balls, this full scale model Match-XV ball depicts exactly the distinctive markings of the ball used in the Final match played at Twickenham in London between New Zealand and Australia, ultimately won by the All Blacks. 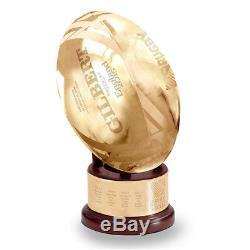 Handcrafted from sterling silver, and plated with 24 carat gold in the very same tank as the Webb Ellis Cup, the stunning rugby ball is fixed upon a plinth that further replicates the one supporting the Webb Ellis Cup, only with a clever kicking tee element to support the ball. 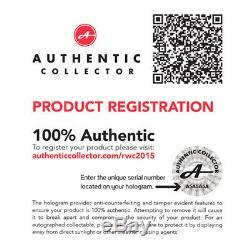 The gold band is engraved with the details of the Tournament Pools, RWC 2015 logo, Playoff fixtures and results. 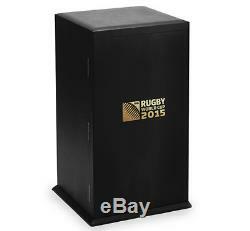 To complete the design, a bespoke presentation case has been created specifically to it's dimensions, with Rugby World Cup 2015 logo stamped in gold. Width (at widest points) 28 cm. 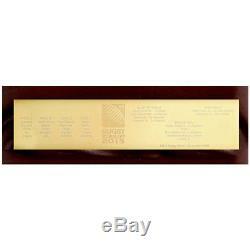 Plinth Width - 18 cm. 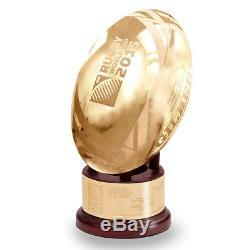 The item "Sterling Silver and 24k Gold Plated Rugby World Cup 2015 Final Match Ball" is in sale since Thursday, November 8, 2018. 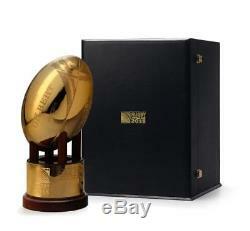 This item is in the category "Sports Memorabilia\Rugby Union Memorabilia\Other Rugby Union Memorabilia". 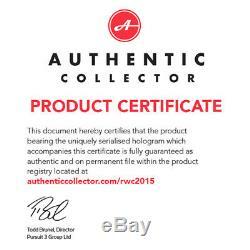 The seller is "gosportsworlduk" and is located in London.